Festive Plants in the House: Are You Mistletoe Aware? You are here: Home / Pet Guides & Help / Cats / Festive plants in the house: Which Christmas plants are poisonous to pets? At this time of year, a lot of us will start buying festive plants. These might be great for adding some winter cheer but they’re not so good for your pets. In fact, some of the plants that are popular in the run up to Christmas can be poisonous for your pet if they come into contact with them. Here’s what you need to know about festive plants such as poinsettias, lilies, hibiscus, mistletoe, holly and ivy from your pet’s perspective! Lilies are very poisonous for cats and can lead to symptoms such as heart arrhythmia, fitting and kidney failure and can even be fatal in some cases. Lilies are another of the festive plants that should always be kept out of reach of pets because eating even a small amount of them can cause these symptoms. A lot of people believe that poinsettias are always fatal for cats but this is something of a myth. In reality, it’s actually not that dangerous compared to some other plants. In the vast majority of cases, it will lead to gastrointestinal symptoms such as diarrhoea and nausea. In theory, it will be dangerous if enough of the plant is eaten but this rarely happens as the taste of the sap is very irritating. Hibiscus can be poisonous to pets, especially dogs. Eating any parts of the plant is likely to lead to gastrointestinal issues such as vomiting, diarrhoea, nausea and appetite loss. The severity of these symptoms can vary. Mistletoe can be quite poisonous. Eating the berries can result in vomiting, diarrhoea, drooling and excessive salivation, stomach pain and blisters in the mouth. Mistletoe can cause abdominal issues and other more serious health problems such as not being able to breathe properly, a sudden reduction in blood pressure to dangerous levels. In the worst cases, these type of symptoms can result in seizures and even death. For this reason, mistletoe is one of the festive plants that should be kept well away from your pets so that there isn’t any chance of them eating it. Like mistletoe, holly can be a fairly serious poison. The symptoms tend to be similar to mistletoe poisoning. Eating ivy can lead to vomiting, diarrhoea and hyperactivity. Eating Amaryllis can lead to symptoms such as vomiting, diarrhoea, appetite loss, abdominal pain, drooling, lethargy and tremors. If the bulb is ingested, this is thought to be even more toxic than the other parts. 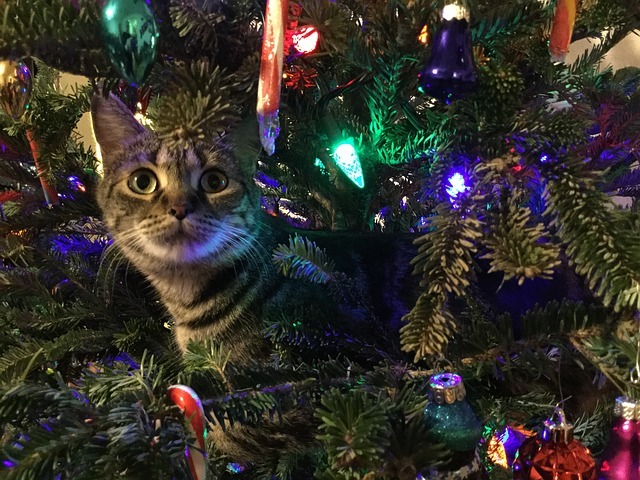 Even your Christmas tree can upset your pet, especially if you have a real one. Fir tree oils can be irritating and cause symptoms such as vomiting and drooling. If your pet does manage to get their paws on any of these festive plants, the symptoms can range from mild to very serious. While some plants will not cause serious problems for your pet’s health, it’s best to seek veterinary advice as soon as possible if you even suspect that your cat or dog has eaten parts of the more toxic plants.